EAGLE COUNTY — If you’re looking for wealth in small American towns, then look for ski lifts. 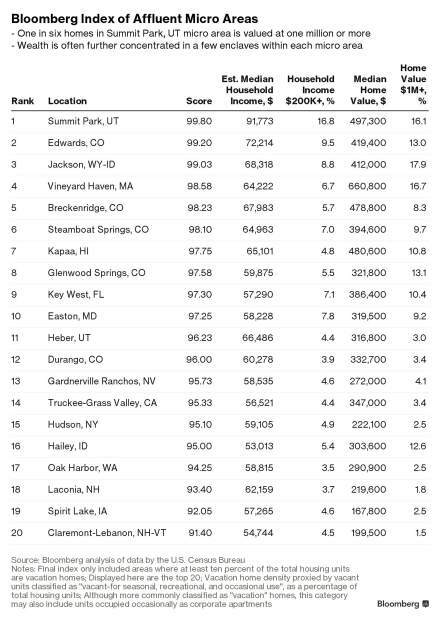 A Bloomberg Business analysis ranked the wealthiest small towns in America and six of the top 10 are dominated by ski areas. Edwards is the nation’s second-most affluent small town because it includes all of Eagle County, if you’re Bloomberg and the U.S. Census Bureau. A Bloomberg Business analysis crunched U.S. Census data and ranked Edwards No. 2, behind Summit Park, Utah, which ascended to Bloomberg’s most affluent two years ago, and has stayed there. For Bloomberg’s and the Census Bureau purposes, the Edwards Micropolitan Statistical Area includes all of Eagle County: the town of Avon, the town of Eagle, the town of Gypsum, the town of Minturn, the town of Red Cliff, the town of Vail, most of the town of Basalt, and unincorporated Eagle County, including Beaver Creek and Bachelor Gulch. To compare, Utah’s Summit Park area runs about 20 miles east of Salt Lake City on Interstate 80, and includes ski areas at Deer Valley and the Park City Mountain Resort. The Census Bureau says micropolitan areas have populations between 10,000 and 50,000 — less than 20 percent of a typical metropolitan region — and are named for an area’s largest population center. That’s Edwards in Eagle County, Glenwood Springs in Roaring Fork Valley, Breckenridge in Summit County, and Steamboat Springs in Routt County. Rich Jones, Director of policy and research for the Bell Policy Center, said the data indicates that a fair amount of wealth is concentrated in Rocky Mountain resort communities. “You have a better picture of it than most people,” Jones said. There’s a concentration of wealth at the very top that pulls the numbers up, with communities on the outside of these resort towns where the workers live. “You end up with a significant number of service jobs, which helps exacerbate the kinds of challenges faced by resort communities,” Jones said. It’s also interesting in how many are resort and retirement communities. They attract money not only from around the U.S., but also from around the world. “In some respects, if you’re the school districts you’re hoping you get a share of that wealth,” Jones said. They do. In Eagle County, second homeowners pay around 60 percent of all residential property taxes, according to County Assessor Mark Chapin’s data: $83,767,916 from out-of-county homeowners and $50,593,956 from in-county residential property owners. 2. Percentage of households with at least $200,000 in income. 4. Percentage of homes worth $1 million or more. Based on that criteria and definition of a micropolitan area, Breckenridge is fifth on Bloomberg’s list; Steamboat Springs is sixth, up from ninth in 2015, and Glenwood Springs is eighth, down from seventh in 2015. In Eagle County and Edwards, the median income is $419,000, and 9.5 percent of the annual median household incomes top $200,000. One in six Summit Park, Utah, homes is worth $1 million or more, and more than half in Park City. Forty-three percent of the Summit Park’s homes are considered vacation properties. In Eagle County and Edwards, 13 percent of all homes are worth $1 million or more. Bloomberg explained that wealth is often further concentrated in a few enclaves within each micro area: Vail, Beaver Creek and Bachelor Gulch in Edwards’ case. In Key West, Florida, No. 9 on Bloomberg’s list, almost 75 percent of the $1 million-plus properties are in North Key Largo. Posted on April 9, 2017 at 3:39 pm.